According to Paul's Unofficial Letterbox Pages and other sources this would be a post box manufactured during George V's reign from 1910 - 1936. There are probably not too many around of those. Not that those are the only Islay postbox pictures on Flickr. 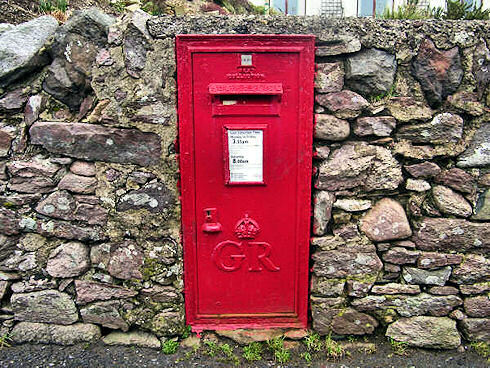 Others include: Post Box at Laphroaig and Postbox at Portnahaven by Ewan. Bruichladdich postbox and this postbox by glenfinlas (not sure where exactly that one is?) can also be found. All of this makes me wonder if I've got any post boxes hidden on some of my Islay pictures. Should I take a look?